New cabinets are one of the best ways to improve the style and functionality of your kitchen. Replacing your cabinets is more than just to way to add more kitchen space, they are an investment that adds obvious home resale value as well as a living value to your home life. 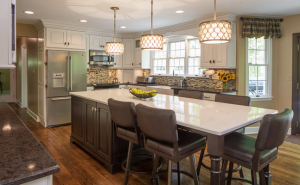 If you’re looking for custom kitchen cabinets in Columbia, Baltimore, Bel Air, Lutherville, Annapolis, or anywhere in Maryland, Kenwood Kitchens has the experience and selection to find exactly what you need. We are consistently ranked as one of the top ten Wood-Mode cabinetry dealers in the nation earning the #1 position several times. We offer a wide variety of affordable cabinetry options, giving you the freedom to improve your kitchen’s design and storage capacity at a cost that falls within your budget. Our kitchen remodels are also designed to offer modern cabinet accessories and features that help both with organization and utility of the kitchen space. Kenwood Kitchens offers fine quality custom kitchen cabinets from our chosen manufacturers that are designed to revamp your kitchen’s look and functionality. Pennsylvania manufacturing facility. It begins with hand selection of furniture-grade lumber, that’s seasoned and kiln-dried on location to meet the finest cabinetry and furniture standards. Each cabinet is assembled by hand, finished and inspected for quality. No matter what style you prefer, Wood-Mode’s designs offer the flexibility to be customized to your home and your style. Brookhaven cabinetry, part of the Wood-Mode family, offers contemporary frameless construction and traditional framed construction. Standard construction features include stained finishes, adjustable shelves with integrated clips, solid wood dovetail drawer boxes, full-extension drawer slides for more storage space. Framed cabinets are built with furniture-quality particleboard for stability and lined with wood grain melamine. Concealed or 180-degree decorative hinges allow maximum access. Brookhaven cabinetry comes with a Lifetime Limited Warranty against material or workmanship defects. Greenfield Cabinetry defines taste and style, with superbly crafted cabinets that exude beauty. Behind every single cabinet door is the ultimate in convenience and efficiency. The value, quality, and choice offered by Greenfield Cabinets is incomparable – from the finest woods, finishes, paints, colors, and styles to the endless selection of configurations to meet your needs. Greenfield masterfully combines form and function with affordability and lasting style. Siteline offers a full range of material and finish choices, to precisely meet your personal style. Custom-made Siteline cabinets can be delivered to Kenwood Kitchens in as little as 4 weeks. Thermally Fused Laminate doors are designed for durability, with an outer layer that resists scratches and dents. Polyester Wrap choices are tick textured and applied to fiberboard for an authentic wood look with the durability of polyester. Thermofoil for the heavy-duty kitchen or bath are created with a polymer that is heat-sealed over medium density fiberboard, for a smooth surface, durability, and stability. For more information about our kitchen cabinet options, call (800) 211-8394 or contact us to speak with a representative.